Integrating environmental considerations into supply-chain management has become one of the major concerns to the industry and researchers. However, supply chains still have to deal with the challenges of effectiveness and cost efficiency. RFID is one of the contemporary technologies which have the potential to enable improved data gathering and cross-companies integration, and thus improve the cost efficiency. 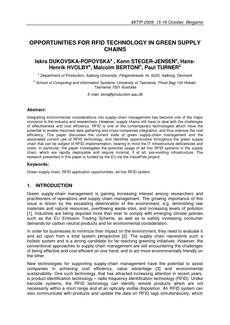 This paper discusses the current state of green supply-chain management and the associated current use of RFID technology, and identifies opportunities throughout the green supply chain that can be subject of RFID implementation, bearing in mind the IT infrastructure deficiencies and costs. In particular, the paper investigates the potential usage of ad hoc RFID systems in the supply chain, which are rapidly deployable and require minimal, if at all, pre-existing infrastructure. The research presented in this paper is funded by the EU via the ValuePole project.